Many Bourbons are named for people: Jim Beam, Basil Hayden, Elijah Craig, Evan Williams, George T. Stagg. Many of these men came to Kentucky in the late 1700s to claim land as part of the Corn Grants, which offered 400 acres to settlers who built cabins and planted corn in the then-territory of Kentucky. Immigrants like Beam from Germany, Basil Hayden from Ireland, and Evan Williams from Wales were among those who were attracted to make a claim. When there was excess corn, making whiskey was the best thing to do! Many of today’s Bourbons pay homage to these courageous and early-distilling immigrants. Jeptha Creed is different. It’s not named for a person, but is instead a value statement. Our home farm is at the foothills of the Jeptha Knobs in Shelby County, Kentucky – we have to drive through the Knobs to travel from the west side of the farm to the east. These hills were named by Squire Boone and Daniel Boone when they came to explore Kentucky in the late 1700s. Documentation shows they named them Jeptha after a Biblical warrior from Judges 11, because hunting was plentiful there due to a salt lick that attracted the buffalo, deer and turkey. It was a meeting place for the animals, and the grocery store of the day! Squire and Daniel Boone are critical to the formation of much of Kentucky’s history and heritage. Shelbyville recently erected a statue in honor of Squire Boone, reflecting just how important the Jeptha Knobs are to local history. Personal, local, state and Biblical history: what more could we ask for in a name? 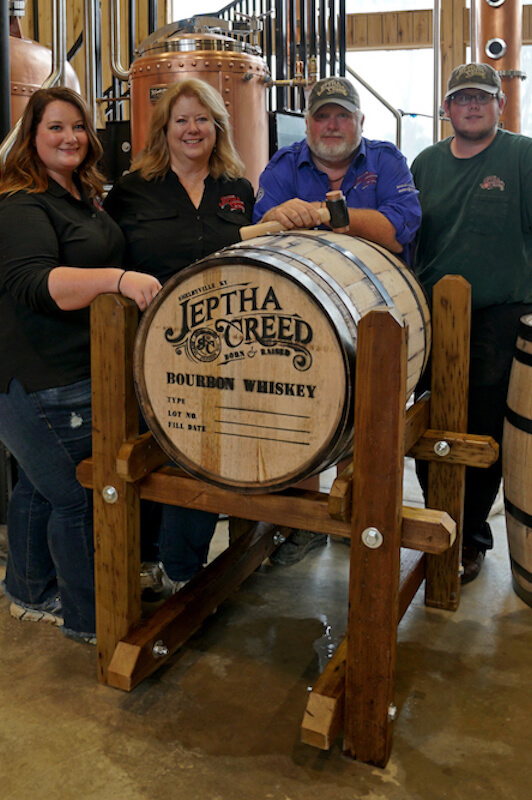 So, why did we choose Jeptha Creed for our distillery name, and not Jeptha Knob? That’s where our Creed, or our value statement, comes in. Our Creed is our promise to honor and stand by our history, heritage, and culture. Creed also means we’re a family and work together. We respect our elders and those who came before us: our Founding Fathers who established this country; our veterans who have fought for us to protect our freedom; the hardworking people and risk-takers. The view from the top of the Jeptha Knobs is breathtaking. We wish to put the same vision into everything we do—from our farmland to the production and taste of our spirits. Through our Creed, we are building a meeting place of Bourbon.